Enjoy you morning coffee, tea or other favorite beverage in this custom branded Guitar Niche mug. 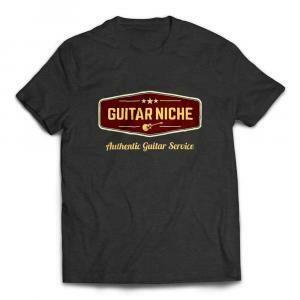 Show you’re a fan of Guitar Niche with your very own branded GN Swag!! Printed and shipped right here in North America. Put your favorite guitar on the most practical of beverage containers – a coffee mug! Makes a GREAT GIFT! Every time you hoist that splendid morning heart-starter beverage, you’ll be reminded of the exceptional beauty of your most prized musical companion, your partner in musical crime, your six string razor, your primary means of expression… ‘nuf said. Order Yours Today! Send us an email, contact us here for image guidelines and current pricing – no worries, it’s relatively cheap. This excellent quality t-shirt is printed and shipped right here in North America.